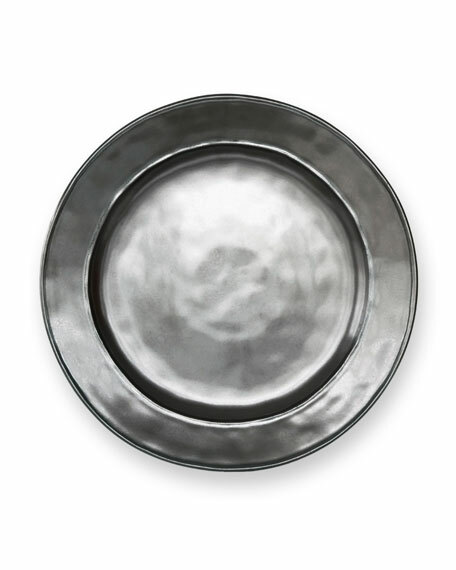 Handcrafted and lead-free stoneware is hand finished in a pewter tone. Freezer, dishwasher, oven, and microwave safe. Fine china dinnerware. Service for four includes four 11"Dia. dinner plates, four 8.75"Dia. salad plates, four 5.75"Dia. 20-oz. cereal bowls, and four 4"Dia. 10-oz. mugs. Dishwasher safe. Microwave safe, low heat only. Imported. Porcelain bread & butter plate. 6"Dia. Hand wash. Imported. Porcelain bread & butter plate. Approximately 6.25"Dia. Hand wash. Made in France. Ceramic stoneware side plate. 9"Dia. Dishwasher, freezer, oven, and microwave safe. Made in Portugal. Sold individually.